January 26, 2019 January 26, 2019 Sarah Gouin Keerie Stampin' Up! 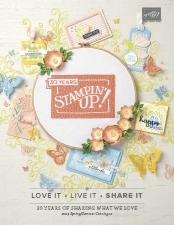 Wow, we are around 3 weeks into Sale-a-bration and Stampin’ Up! have run out of 3 months worth of the organdy ribbon bundle that was a freebie choice. Sadly, there is no more coming to the warehouse. However, if you have it as a back order, there is enough stock coming to fulfil these orders. Unlucky for me, as it had it on the list to add to a ‘brewing’ order and now, even as a demo, I am out of luck too. Boo hoo. You still have lots of choices though to choose from as your free item. Another update I want to share with you is that we have two punches that are running low on inventory. These are the cake building and butterfly duo punches. These also form part of the cost saving bundles. Now is a good time to order these if you want them sooner rather than later as they are likely to go onto back order and we won’t see them back again until mid-March. Good news with the punches though, and if you can wait for them, they are going to be in the next annual catalogue, but this doesn’t get released until June. They also won’t be a part of the bundle if you are looking at making that saving when you get the stamps and coordinating punch. So, if you have them on your list, I’d get them sooner rather than later.